It’s a cold snowy day here, so what else would I do but make a cinnamon coffee cake this morning. We need something to warm our bellies in these close to single digit temperatures, wind gusts and snow flakes. Loving to bake is something I probably take for granted. I’ve been doing it my whole life. Now that we have food allergies, I realize I’ve been taking something else for granted, fresh bakery bread. There are the obvious foods that we can’t eat. Nuts. Peanuts and most tree nuts are off limits. But what most people don’t realize is that it opens up a wide array of foods that are also considered “unsafe” and that includes bakery goods. One of our local bakeries won’t even accomodate food allergies with special orders. They say they cannot guarantee 100% safety from cross contamination. Honestly, I don’t know if I would trust a bakery that would accomadate us. Not unless they would allow me to apron up and join them in the kitchen. So, with that being said, I thought I would share some of my new at home favorites that I’ve learned to make over the past 21 months since we ventured to the hospital with our first episode anaphylaxis. For each I’m just going to direct my readers to the webpages where I have stumbled upon these great recipes. First, I’ll start with the cinnamon coffee cake I made this morning and have been eating all day. My friend shared this on Facebook not that long ago and I knew the first snow day we had I would be making it. Who wouldn’t drool over that? Or eat it all day long? I have done both. Great delicious cake that was pretty quick and easy to throw together. Next up. Fresh bread. I tried on multiple occasions to make homemade loaf bread and I failed every time. 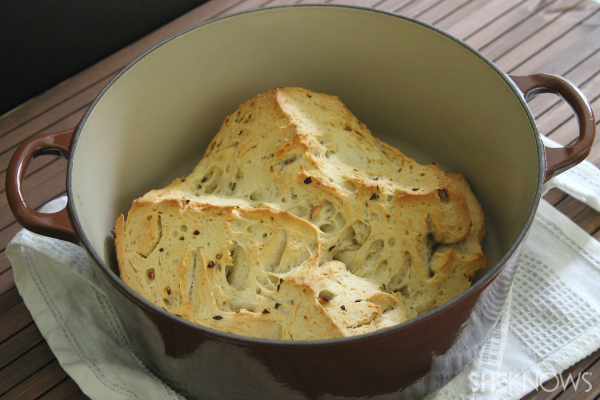 So, I moved on to good hearty bread that is awesome with soups, stews or Italian dishes. Plus, it’s the easiest thing ever to make. I actually feel foolish for buying bread after making these next two recipes. This is my tried and true no knead bread. It is a fix it and forget type but always gets rave reviews. This bread is also egg and dairy free! This is always a staple around our house and it doesn’t last long. Then over the weekend I realized I was a Pinterest hoarder and thought I should put some pins to good use, so I made garlic rosemary bread. This bread will be a repeat offender. It was as easy as it was delicious. Next up in the bread catagory are dinner rolls. 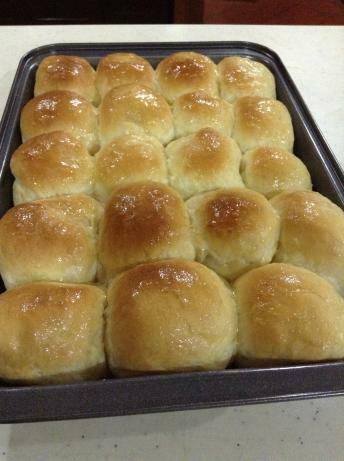 I will admit that after failing at loaf bread and biscuits, I wasn’t too keen on wasting time and ingredients to make rolls. But the snow got to me into a baking mode (it isn’t hard) one day last winter and I experimented and fell in love. These are pretty simple and delicious. A big shout out to user “Jean” at Food.com for submitting this recipe! 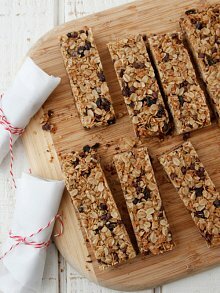 The last DIY recipe is granola bars. Where these aren’t “bakery staples” they have been a staple of my diet for longer than I can remember and I miss them terribly now. It’s hard to find decent ones that won’t break the bank and are safe to eat. Most companies have nuts in one variety of bar so all are contaminated. The ones that are safe I usually end up giving to the kids and not inhaling them myself, so I’m still missing out. Then my friend turned me on to these chocolate chip granola bars from Weelicious. These got rave reviews from the kiddos and were beyond easy to make. I highly recommend them. Also dairy and egg free! So there it is. Easy, simple baking that is allergy friendly. All of these even the most novice and “time crunched” bakers could tackle successfully. I hope you enjoy making and eating these as much as I do!